"A delicious one-pan dinner that tastes like you cooked all day but only takes a small amount of hands-on time. Great flavor and easy clean-up! We make extra sprouts, my family loves them." Place the bacon in a large, deep skillet, and cook over medium-high heat, turning occasionally, until lightly browned but still soft, about 5 minutes. Drain the bacon slices on a paper towel-lined plate. Coat a large baking dish or cast iron skillet with 1 tablespoon olive oil. Arrange lemon slices in a single layer on the bottom of the baking dish. Stir remaining 5 tablespoons olive oil, lemon juice, garlic, kosher salt, and black pepper together in a large bowl. Toss Brussels sprouts in lemon juice mixture to coat; transfer to the prepared baking dish with a slotted spoon, draining excess liquid back into the bowl. Place bacon on top of the Brussels sprouts. Toss potatoes in the same lemon juice mixture used for the Brussels sprouts. Remove potatoes with slotted spoon and arrange along the inside edge of the baking dish. Coat chicken breast halves thoroughly in the remaining lemon mixture. Place chicken breasts skin-side up in the skillet; pour any remaining lemon juice mixture over chicken. Bake in the preheated oven until chicken no longer pink at the bone and the juices run clear, about 60 minutes. An instant-read thermometer inserted near the bone should read 165 degrees F (74 degrees C). 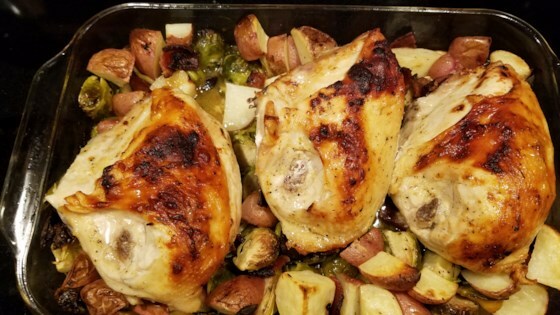 Try this one-pan, roasted chicken dinner ready in 90 minutes or less! Hi, this is my recipe and I would use at least a pound of sprouts not a 1/2 pound. My sons tell me I never cook enough of the sprouts.